UPSSSC Mandi Inspector, Junior Assistant Syllabus 2018 Check Here. UPSSSC Mandi Inspector, Junior Assistant and Other Govt Job Objection List and Re Upload Photo and Signature Check Here. UPSSSC Stenographer 2017 Admit Card Check Here. UPSSSC Notification is out. 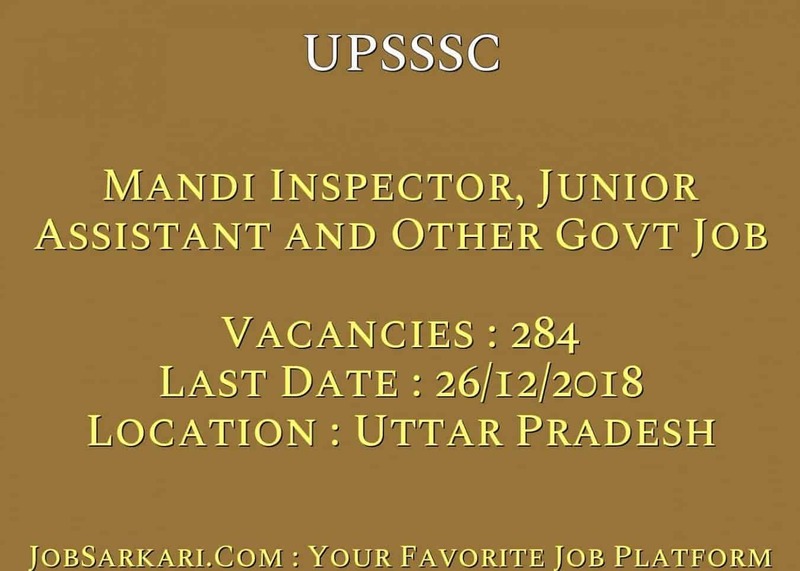 UPSSSC is recruiting for 284 Mandi Inspector, Junior Assistant and Other Govt Job Photo, Sign Objection List 2019 Posts. You can check UPSSSC - Uttar Pradesh Subordinate Service Selection Commission last date, download UPSSSC notification, visit UPSSSC official website and check other UPSSSC Vacancy details.Complete Vacancy and recruitment Details about 284 Mandi Inspector, Junior Assistant and Other Govt Job Photo, Sign Objection List 2019 vacancies in UPSSSC are provided below by JobSarkari.Com only for you. Last Date for Apply Online 26/12/2018. Last Date for Payment of Exam Fee 26/12/2018. Last Date for Correction in Application Form 02/01/2019. 94 49 38 00 181. Junior Assistant (Samanya Chayan) 11 04 03 00 18. Junior Assistant (Vishesh Chayan) 00 00 15 02 17. Stenographer 05 04 01 00 10. Market Supervisor Grade II 06 02 02 00 10. Account Clerk 24 12 11 01 48. Total No of Post 140 71 70 03 284. Mandi Inspector Amin / Auctioneer Candidate Must Have Passed Graduation in Any Discipline. Junior Assistant (Samanya Chayan) Candidate Must Have Passed Graduation in Any Discipline With Typing Speed of 25 WPM in Hindi And Having Knowledge of Computer. Junior Assistant (Vishesh Chayan) Candidate Must Have Passed Graduation in Any Discipline With Typing Speed of 25 WPM in Hindi And Having Knowledge of Computer. Stenographer Candidate Must Have Passed Bachelor Degree in Any Discipline And Having 80 WPM Hindi Stenographer And 30 WPM Hindi Typing. Candidate Must Have Passed Graduation in Any Discipline With 50% Marks And Must Have Passed Class 12th With 50% Marks (45% Marks For SC/ ST/ PH). Account Clerk Candidate Must Have Passed Bachelor Degree in Commerce (B.Com). 3.After Registration System Will Generate a Login ID and Password. 4.Login With ID and Password to Complete the Application Process. 7.Online Application Can be Submitted on or Before 26th December 2018. Q. What is the Last Date For UPSSSC Mandi Inspector, Junior Assistant and Other Govt Job Photo, Sign Objection List 2019 Vacancy ? A. 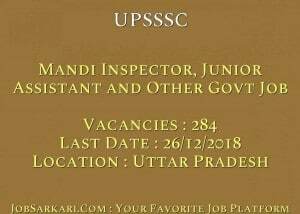 Last Date for UPSSSC Mandi Inspector, Junior Assistant and Other Govt Job Photo, Sign Objection List 2019 Posts is 26/12/2018. Q. What is the Form Type of UPSSSC Mandi Inspector, Junior Assistant and Other Govt Job Photo, Sign Objection List 2019 Recruitment ? A. The Form Type for UPSSSC Mandi Inspector, Junior Assistant and Other Govt Job Photo, Sign Objection List 2019 Posts is Online. Q. How many vacancies are available in Uttar Pradesh Subordinate Service Selection Commission Mandi Inspector, Junior Assistant and Other Govt Job Photo, Sign Objection List 2019 Posts ? A. There are about 300 Vacancies in Uttar Pradesh Subordinate Service Selection Commission Mandi Inspector, Junior Assistant and Other Govt Job Photo, Sign Objection List 2019 Posts.